I don’t even want you to see my house right now. I’ve been buying things for my Round Top booth, and it’s a bit of a mess. I really, really don’t do well with with clutter, and now my entire house looks like this. I cannot believe I just showed you that! This is the kind of thing that stresses me. I don’t think anyone likes clutter, and so that is my topic for today, how do you take things and make them look organized and elegant rather than chaotic and cluttered? Well we all have our tricks, but here is mine — containers. Yup, containers make everyone look organized. What do I mean by container? I mean trays. But it doesn’t have to be a try. Here instead of using a tray, I used a bread board to make everything feel like it was a cohesive grouping. The item just needs to ‘contain’ the items or at least corral them. The same concept applies if you use a tote box. It organizes stuff or at least makes things look organized. The tray can be simple or fancy. 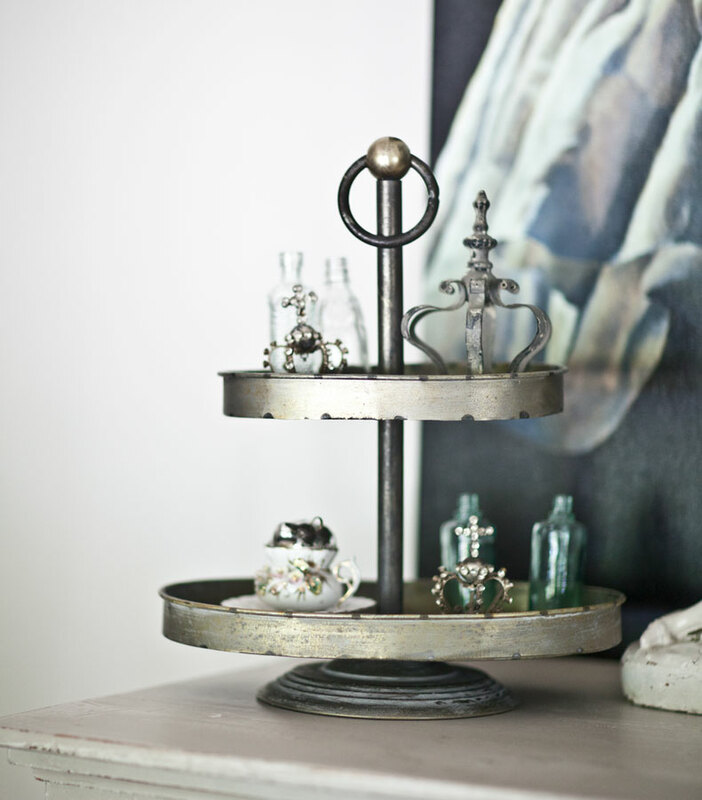 Even using a tiered tray gives the same effect of organization. A dough bowl could even be used to contain things. As reminder, here are a few events I have coming up. BOOK SIGNING AT MARBURGER SEPT 29 8 AM TO 3 PM. MARBURGER FARM. My book launch party was yesterday so while you are reading this, I may still be recovering. Just wondering how much you are asking for the Johnson Brothers Rose Chintz ironstone on your table? I’ve always admired that China. I don’t know yet. I haven’t priced it yet. I hate clutter, too. Unfortunately, clutter has been a battle for the past 3 years since we downsized. I’ve have rid our home of many items through yard sales and trips to the Goodwill. 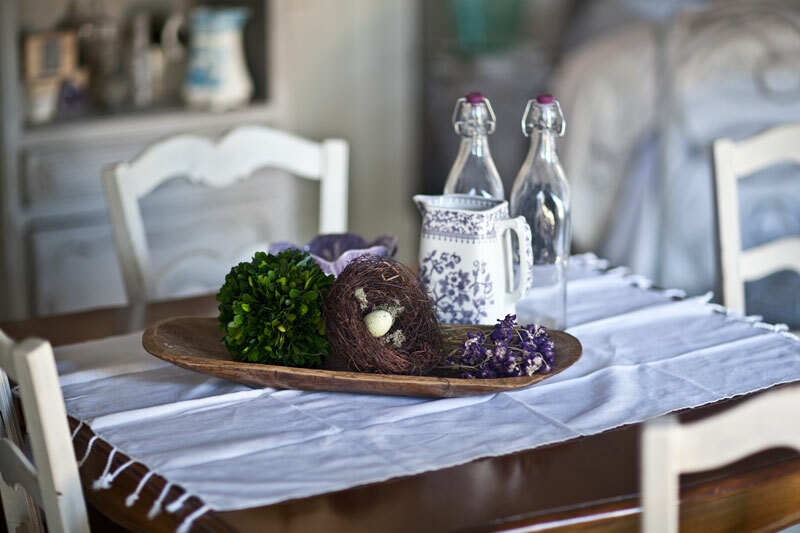 Still, it is hard for me to get rid of beloved antiques and seasonal decor. I use it all and love it all. I’m still trying to fine tune a way of efficiently storing it all. I need a breakthrough for organizing rooms. ( Can I get a witness!?) How in the world to get rid of stuff. Where in the world to put stuff that we have to keep. Small amount of storage. Small house. Live with folks who love their stuff more than I love their stuff! Love Cedar Hill! Blogs are great! And I never read blogs. Tee hee! Love seeing all your beautiful trays and organization. 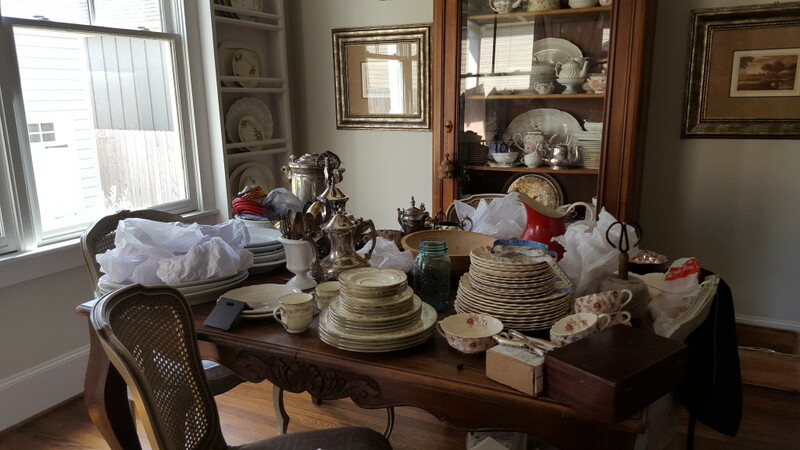 It’s my kitchen table – it drives me crazy. But it seems to be my command center. You have so many beautiful items. I totally, understand your woes with clutter!!! I’ve been eliminating all the items we “acquired” for our Bits ‘n Pieces booth since January!!! We still have one storage tub filled with merchandise to donate for our Church Bazaar!!! Hold close to your mind the thought of how relieved you’ll be when you “clear the table” and head out to Round Top!!! Much continued $uccess, dear friend!!! seam to take a big hit, my table mostly because i do my homework there. It is frustrating at times. Great post Anita! Sure wish I could shop with you at Round top! One day I hope to get out there from Michigan. 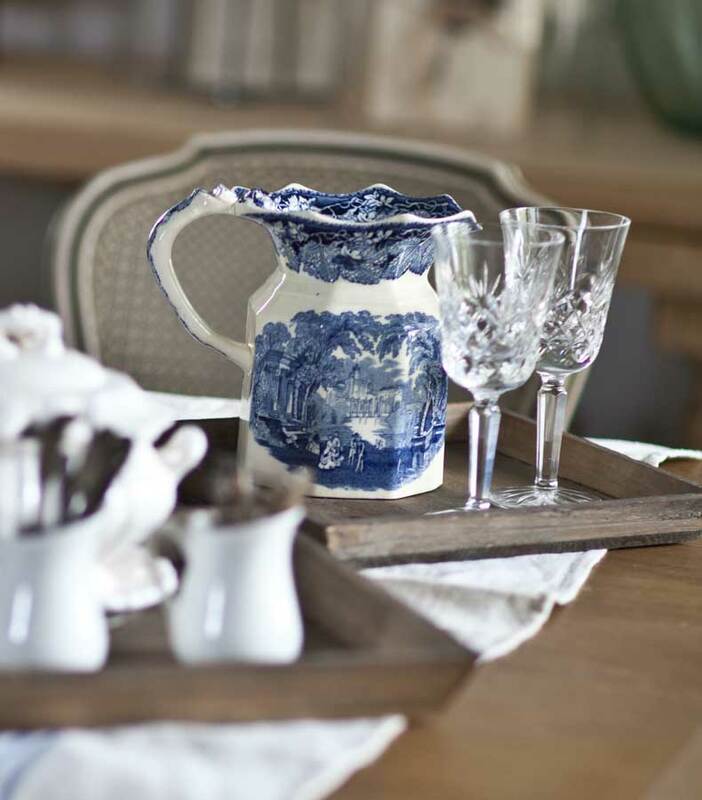 This is a great post and yes, trays really help make things look cohesive. My husband and I just got our house back in order after doing a Vintage Market. It was driving me crazy to have stuff all over. After round top, you’ll be organized again. 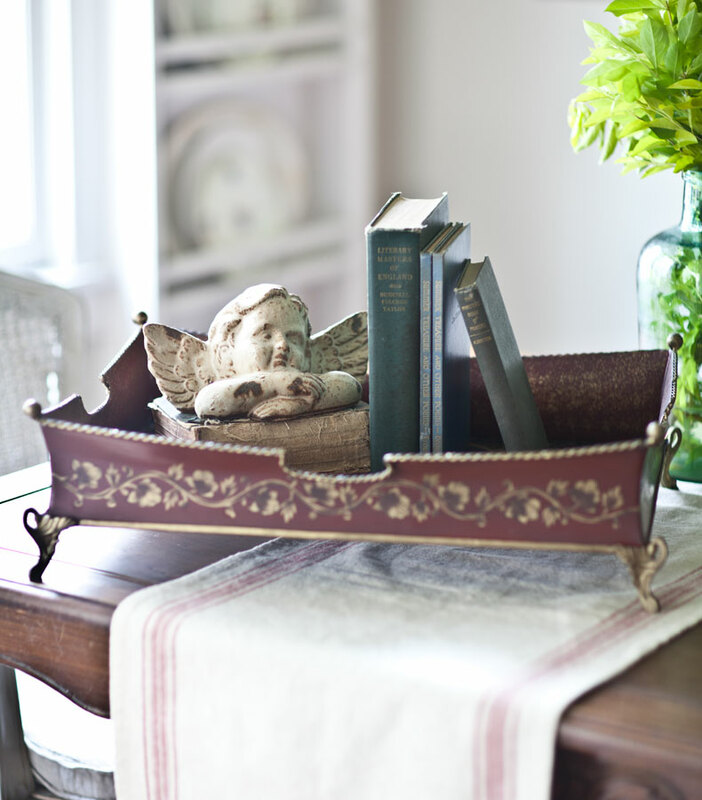 Love the items you’ll be carrying at the show. Love your book, I’m telling everyone about it. Thank you Alvena. Wish I could meet you some day. Lesley do you mean you have one box for each season or one box for everything not being used at the moment? One box for each colour. My boxes range through red, green gold, purple (four boxes) for winter/ Christmas. Then into Sping with lighter shades such as pink, green, lilac , pale blue. I also love peach, so at least one area is in peach all year. At the moment it’s the landing. But I think the dining room will get the peach treatment soon. I’m planning on putting up my silver and purple Christmas decks. outside for a new garden look. I think the trees will look good decked out in a new livery. I’m also changing my patio covers and cushions into purple and silver as well. Just wanted go say how much I love your blog overall. But something that I find unique and always read is your “on a personal note.” Great way to make your decorating blog a little different from all the others. Thanks Jamie!! I put it on the side of my newsletters, so those that aren’t interested can skip over it if they like. Where can I buy the Gold Rope Edged Tray? I took it out of my shop, and kept it for myself. Sorry. 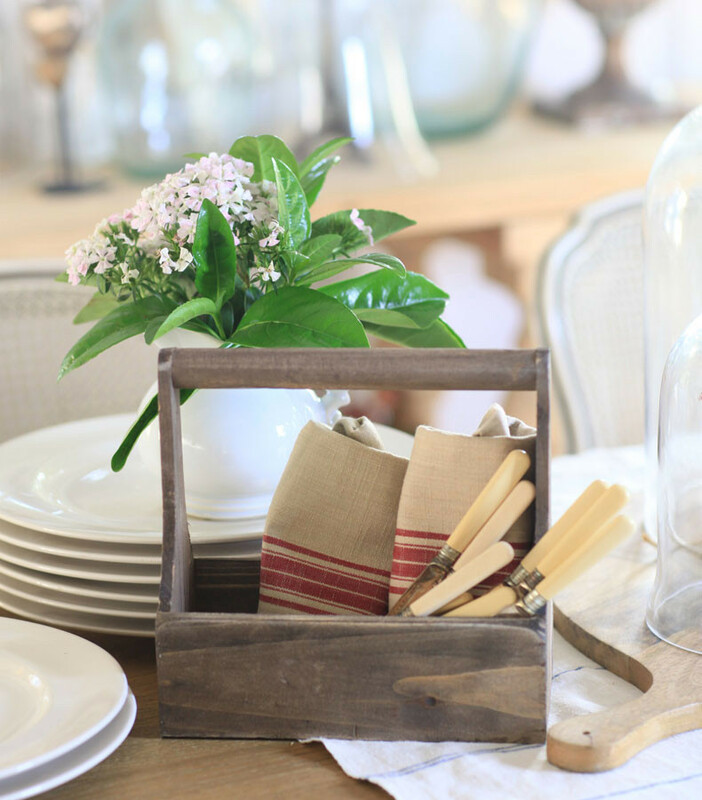 Re-read this today with your most recent post, I’m clearing out the clutter and getting ready for a spring garage sale, keeping only those things that I absolutely love around me. This past year I’ve found/thrifted several wooden trays that have become oh so helpful in keeping things corralled, they are so useful! 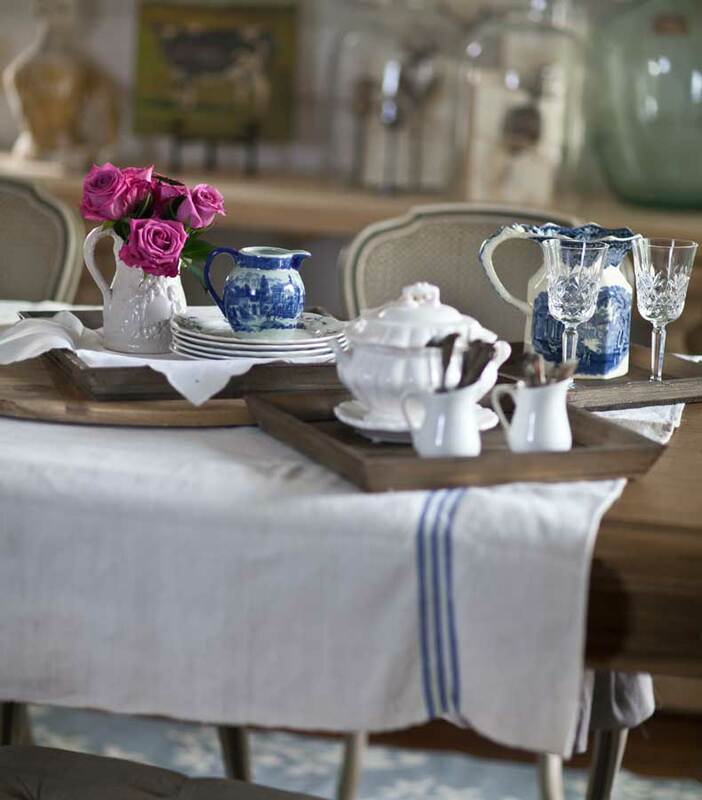 I also have a table cloth with a blue stripe that looks exactly like the one on your table, I knew I saw it somewhere and it was on your blog! Where is your booth in Round Top and when are you going to be there? Arza, I don’t have a booth this year. Anita, I have been searching for months for the beautiful sitting French vintage lamb that you have used on several past posts on your fireplace mantel, table etc. I am having no luck. Any ideas or do you have one you are thinking of selling? I love reading your email posts. You are one beautiful lady! Ginger, I sold them for about a year, then stopped carrying them. Love your ideas, thanks for sharing!